This week, it was reported that the number of Americans filing for unemployment benefits last week was the lowest since 1969! The official unemployment rate is also near an all-time low. In Japan and the UK too, the unemployment rates are near lows and in Europe, the official rate is heading back to pre-global crash levels. As I have reported in previous posts, measures of economic activity from various sources suggest that the world capitalist economy has been picking up pace in growth since the near slump of 2015-16. This is particularly the case for the most important capitalist economy, the US. 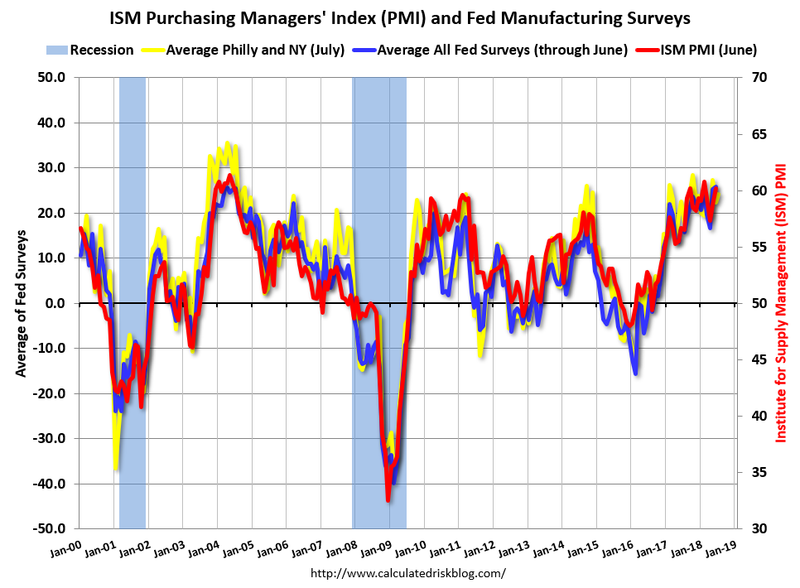 Below is the world composite PMI (purchasing managers index). This is a survey globally of the state of economic activity in both manufacturing and service industries as the corporate executives see it. If the measure is above 50, world economic activity is rising. Currently, the PMI shows a return to trend expansion after the near contraction of 2015. Next week we shall get the first estimate of US real GDP growth for the second quarter of 2018. It is likely to be strong. The Atlanta Federal Reserve has a ‘high frequency’ forecast measure for each quarter’s growth and it currently expects the Q2 figure to come in at a 4.5% annual rate. That means real growth in Q2 would be about 1% point above Q1. If that turns out to be right, it means that the US economy would have motored along at about 3% for the first half of 2018. But the most usable surveys of economic activity in the US do show that the economy is expanding at a reasonably fast rate (if no faster than the average of 3.3% since 1945). Here is a graph that combines various surveys of economic activity in the US. Anything above 0 (LHS) or 50 (RHS) implies that the economy is growing. The current RHS rate is close to 60 which implies fast expansion – certainly compared to 2016 when the measure was below 50, implying contraction and, of course, much higher compared to the Great Recession when output collapsed. The other major capitalist economies do not seem to be doing as well as the US, despite previously optimistic reports. The EU is growing at about 1.6% annually, the UK at under 1%, and Japan is actually contracting. Nevertheless, global growth is expected to show an acceleration in 2018 over 2017, when all the emerging economies of China, India etc are included. But can we get more frequent and comprehensive measures that could actually forecast accurately what will happen in future quarters and years? The huge eruption of what is called ‘big data’ from the internet, social media and other sources in the last ten years has led to a new industry of forecasting that aims to deliver more frequent and accurate estimates of future developments, in the same way that weather forecasting has improved. The Federal Reserve Bank of New York has refined this big data in its own survey of US economic activity. And as long ago as 2013, the Bank of England’s economists looked at the use and efficacy of big data. They looked at indicators for global growth in industrial production and trade. They found that sharp changes in various indicators were a good guide to future production and growth. However, the problem with these indicators of future expansion is that they are not that timely, with data only on a monthly (if you are lucky) but more usually on a quarterly basis. 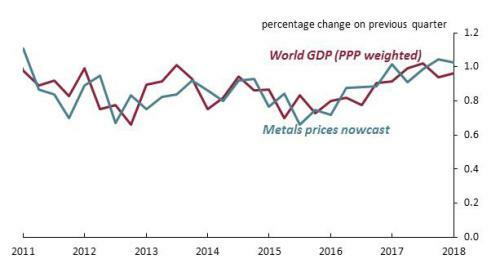 In other words, the pace of change in metals prices in this month of July will give a reasonable estimate of world real GDP growth for July (and eventually Q3), well ahead of any official data (Q3 world growth is not going to be available until January 2019). The Bank of England economists used the S&P metals prices index as their metals prices indicator. As you can see (circles), the metals index fell sharply during the Great Recession in real GDP and predicted the subsequent recovery exactly in mid-2009. Similarly it predicted the recovery from the relative slump in 2015. Remember the actual real GDP figures for most countries do not become available until up to two quarters later or even more. So the metals index becomes a ‘high frequency’ indicator for growth. Copper is the largest constituent of the index and it is a metal used in just about every important industrial and consumer appliance or service. So the copper prices index is also likely to be a good indicator, in my view. When I ran the copper price against world GDP growth, the correlation was very good. So looking ahead, what do the metals price and copper price indexes tell us about the current Q3 period and onwards? I did the trend measure of the copper price, and it shows that expansion from the trough of 2015-16 seems to have peaked. That suggests the global expansion from 2017 which was above the trend rate has now subsided back to the trend and may fall below. The metals price index also suggests that the peak in the current acceleration of global (and US?) growth ended in June 2018 and the direction is now downwards in Q3 (the period beginning in July). So don’t be overwhelmed by the good news stories about US real GDP figures for Q2 2018 next week. This entry was posted on July 20, 2018 at 12:02 pm and is filed under capitalism, economics. You can follow any responses to this entry through the RSS 2.0 feed. You can leave a response, or trackback from your own site. The working class continues to produce a larger and larger amount of wealth, aka “capital”, for the capitalist class in exchange for the price of labour power. I would guess that labour’s share of this wealth is not growing though with all the cuts to wages, working conditions and the social wage. It seems that the world is not in a “long depression”, “secular stagnation” and so on after all, and that all those predictions over the last three years that a falling rate of profit was about to lead to a fall in investment that would bring about a new recession within months, each year put off to the next year, were simply wrong. As I pointed out during all that time as each one of these predictions were made, they were wrong in terms of Marx’s theory, and they turned out, therefore, to be also wrong in fact. As usually, you view things through official data only, missing the the material world of endless, imperial wars, precarious gig labor, etc, etc. Ah, so its all Trumpian “Fake News” then, and even Michael has fallen for it, in the data he presents here! I concur; furthermore, I’m highly suspicious of so-called official data. Welcome to Boffy’s non-sequiturs. Whether or not we are in a Depression has nothing to do with the potential for crisis in the past three years. 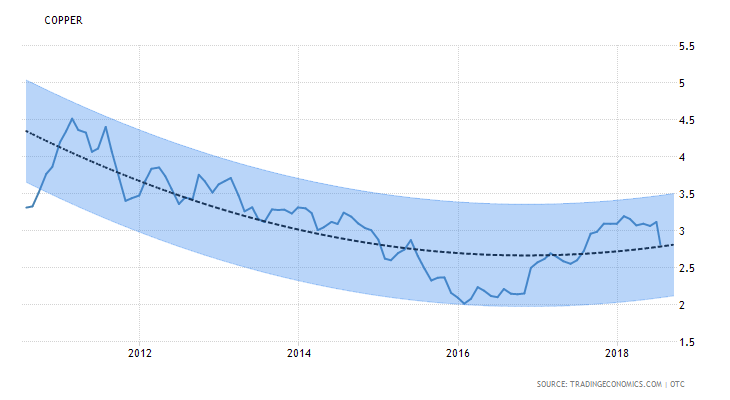 It is based on trends that have occurred in the global economy since 2008, at no point did Michael Roberts ever say ‘There’s going to be a recession for sure and if not everything I said is wrong’. But speaking about Marx did he not claim that there was bound to be a crisis every 7-10 years? Then we have been due one yes? We still in a long depression. The elites are just manipulated the data to hide it. I have to come to the realization long ago our financial mainstream data is used as a source of propagranda. To reiterate, I believe we are in a period of a long depression. The has been no Trump bump in the core US economy just more asset price inflation. Well timed Tony. The next US GDP report is out shortly. Could be above 4.5%, the highest in eight years. However, much of this is brought forward activity and much relates to the trade war. Hence inventory, exports and car sales have jumped. However this is stealing from the future. On the other side is the 12% fall in housing starts in June coupled to many more homes being put on the market suddenly. So a mixed bag. The Trump adrenalin rush most probably has another quarter to go and yes it did pump up the economy but like all opportunist measures the bill (deficit) comes in later. Either way its certainly not a recession as has been predicted repeatedly for the last few years here, and it is certainly not a long depression. Moreover, its not just the US that is experiencing such growth. The EU is also experiencing stronger growth, and 90 of the world’s economies are now experiencing above trend growth, many of them at rates only previously seen in the early 2000’s when the current long wave expansion had just begun. The catastrophists should just admit that as with their cothinkers in the Stalinist camp after WWII, who could not believe that capitalism was not in its death agony, they got it wrong. They put their hope (a misguided hope at that, given what usually happens during periods of prolonged economic stagnation that encourages reaction) in some catastrophe befalling capitalism, given that their own efforts at winning the support of workers had failed. They hoped that if their own attempts to persuade workers of the benefits of socialism had fallen on stony ground, then at least if capitalism were to become really, really intolerable then the workers might at least come to them, on the basis that anything might be better than what they had. In other words, instead of the message of hope and development that Marx presented to workers, they present workers instead with a vision of slightly ameliorated misery. Given that, as with the 1950’s when Varga and Co. were insisting that workers in the West were suffering increasing immiseration, and as with Trump’s ridiculous tweets about the collapse of any organisation he dislikes, that capitalism was in its last days, the workers look at the reality, and reject the miserable future the catastrophists offer up to them. Should read 90% of the world’s economies. Once again the ridiculousness of Boffy’s beliefs exposed! There has been nothing close to the post WW2 boom since 1999, this is obvious to most people. Boffy however must belief in an automatic new Long Expansionary Wave no matter what. Doesn’t seem very scientific to me. Perhaps you see World Wars 1 and 2 (certainly a 30 years catastrophic war for all of humanity and especially for the 90 million directly destroyed) positively (it certainly resulted in post war increases in worker productivity and (for short time) in a higher standard of living for (some) workers in Europe and the USA; perhaps you view the wars of the Cold War and the ensuing dictatorship-cleansing, humanitarian wars (that are now threatening to engross Iran, Russia, and China) positively also. Maybe you are enthusiastic about the productivity of labor in the production of nuclear weapons. But for us catastrophists and “stalinist co-thinkers”, these endless actualized and potential human catastrophes represent the barbarism that followed the collapse of the real socialist movement in the west after the sell out of the Second International. That collapse has finally caught up with the social democrats, who for a time served capital well, and have been rewarded as well placed neoliberal marxists. So maybe you are not really the defunct social democrat you seem to be and are actually enthusiastic about the destruction of the social democratic labor movement beginning in the 70’s. After all, didn’t Marx believe that socialism will be possible only after capitalism has exhausted its potential for increasing the productivity–not of human beings, but of labor power? Putting it that way, of course, is Boffyism transmogrified into marxism. Labor power produces nothing but money for capitalists in the form of surplus value, which depends on precariously employed and indebted workers (employed and unemployed, living and dead) to valorize. “Perhaps you see World Wars 1 and 2 (certainly a 30 years catastrophic war for all of humanity and especially for the 90 million directly destroyed) positively (it certainly resulted in post war increases in worker productivity and (for short time) in a higher standard of living for (some) workers in Europe and the USA”. Perhaps for once you could address what I have actually said rather than what you think I perhaps might believe. Then perhaps I might take you more seriously and consider responding to what you have said. Until then, perhaps you should just keep debating with the straw men you erect. “The workers look at reality and reject the miserable future the… [capitalists]… offer up to them.” I changed “catastrophists” to “capitalists”, not to create a straw man (you already did that), but in order to make your assertion conform better to material reality, something like what Marx did by inserting use value into the bourgeois commodity equation. Simply replacing “perhaps” with “apparently” doesn’t change anything does it? It simply means that as usual, you use assertion, innuendo and your own words rather than reference to actual statements and arguments as the basis of your rant. Where you do, as in your last paragraph refer to some actual statement, rather than addressing it with rational argument, and evidence, you simply follow your usual method of unsubstantiated allegations based on vague assertions. Its why I can’t take you at all seriously, and why I won’t bother responding to anything you say unless you present some kind of evidence based, rational argument. Boffy the one fact that you cannot ignore is that since 2011 in China and 2014 in the USA, the rate of profit has fallen sharply. I consider 2014 to have been the peak and until the rate of profit rises above that level, capitalism remains trapped in rising animation and has not entered into the phase of prosperity. Profits continue to be well below their 2014 peak in real terms which is why the behaviour of interest rates is so important. If interest rates normalise lifting the cost of capital then the depressed rate of profit becomes problematic. Capitalism remains vulnerable which is masked by the Trump put. For the reasons I have set out before, I think its difficult to determine what is happening with the rate of profit – let alone the annual rate of profit upon which the average rate of profit is based – because the nature of economic data as presented does not enable it to be calculated. That is not for the reasons the Trumpists or the conspiracy theorists here present, but simply as Marx and Engels showed, the nature of the data they collect is based upon different objectives. It is based upon market prices not values, it is based upon laid-out capital not advanced capital, it is based upon Adam Smith’s “absurd dogma” that the value of commodities/national output resolves entirely into revenues etc. The latter means that GDP figures provide only data on new value added during the year, i.e. (v+s), and do not include c. Given that a large part of Marx’s argument in setting out his law of a falling rate of profit was to show that the inadequacy of the Ricardian theory flowed from the failure to include the value of c, in that calculation, so that it was really just a calculation of the rate of surplus value, the omission of that data is rather important. The fact that the data is for laid out capital rather than advanced capital means the annual rate of profit, in any case cannot be calculated. However, from Marx’s theory and discussion of the cycle, and causes of crises of overproduction, as set out in TOSV Chapter 17, Section 6, and in Capital III, Chapter 6 and 15, then we would expect that from around 2012, we would see the rate of profit falling. It would be falling not because of the long term tendency for the rate of profit to fall, but for the reason Marx sets out in the above places. That is, that capital has hit the limit of expanding absolute surplus value. It has brought in a large part of the relative surplus population, it has brought in women and immigrants where possible, it has extended the working-day, including when necessary paying overtime for it. Moreover, at this point, the productivity gains obtained from the previous round of labour-saving technologies, start to lose their potency. Increasingly, capital expands on the basis of extensive rather than intensive accumulation. So, it finds it more difficult also to obtain increases in relative surplus value. That is the same kind of situation as was seen from around 1962 in the previous, fourth long wave cycle, which led to the profits squeeze of the 1960’s and 1970’s, which leads into the crisis phase of the mid 1970’s and after. It leads to a new round of technological development to produce new labour-saving technologies, and so on. So, yes, quite possible that there has been a profits squeeze starting from around 2012/2013, but as with previous instances of the same thing, it has nothing to do with Marx’s Law of the Falling Rate of Profit. In fact, as Marx shows in TOSV, that profits squeeze arises from the exact opposite conditions that underlie his law. Where his law is based upon rising productivity, rising rate of surplus value, and a rising mass of profit, the profits squeeze is based upon falling or stagnant productivity (i.e. an inability to increase the mass of surplus value, and as he says in Cap. III, Ch. 15, even a tendency for wages to rise as labour supplies run short), a falling rate of surplus value, due to the aforesaid, and at a certain point, therefore, a falling mass of profit itself. Its precisely that, which amounts to an overaccumulation of capital, and consequent crisis of overproduction. 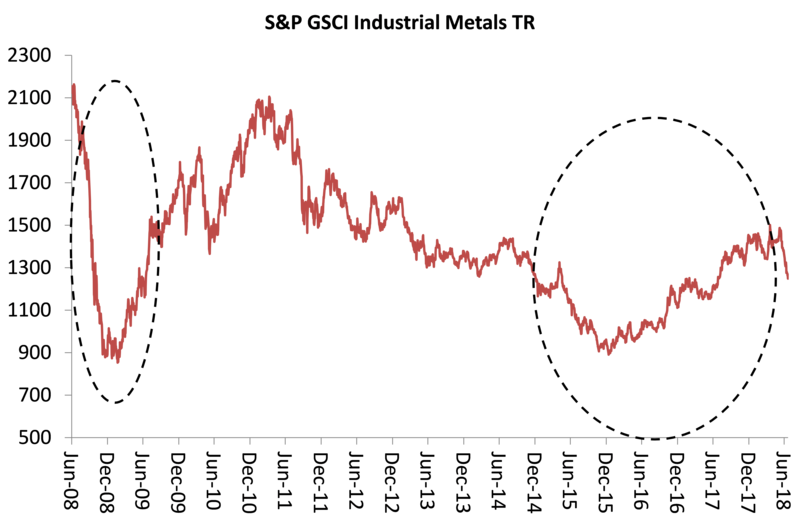 The fact remains that from the mid to late 1980’s, the global rate of profit clearly rose for the reasons Marx sets out, relating to such periods. It clearly rose, and resulted in a growing mass of profit, because it funded the massive global accumulation of capital, which saw the global working class double from the 1980’s to 2000 and so on. It did all that despite central banks trying to divert that available money-capital into keeping asset prices inflated. After 2008, that attempt became even more frenetic, which is why the period after 2008 became distorted, especially when combined with all of the measures of austerity designed to restrain economic growth, and thereby keep interest rates low. The fact that the rate of profit starts to get squeezed as a result of the factors set out above does not at all mean that the rate of profit – particularly the annual rate of profit is low absolutely. When interest rates rise, as the demand for money-capital exceeds the supply, central banks will no longer be able to sustain asset prices. As financial and property markets crash, the speculative money flows into those things will instead revert to real capital accumulation. On the surface, your facts are correct. But merely alluding to the rise of the productivity of labor in the 80’s, is no substitute for the explanatory power of historical/social context, nor is throwing in Marx by name a substitute for his method of historical material analysis. The 80’s was a time when capital’s financial/military directed imperial system cashed in on its expensive, but successful genocidal (Korea, Vietnam, Congo, etc.) wars against successful national liberation regimes in Asia and Africa by combining regime change (Middle East) invasions, occupations, sanctions, blockades, and colorfully orchestrated “revolutions” (Eastern Europe) at the peripheries with so-called neoliberal labor “reforms” at the imperial centers (increasingly precarious, poorly paid jobs and debt peonage for those employed). These extra-economic violent (legal and mostly criminal) activities created the conditions that produced the massive accumulation of capital to which you refer, as well as the doubling of the world’s super-exploited working population whose labor created the profits. These policies also laid the foundation for the present crises of the global system. Of course, you don’t agree with this “catastrophic” view of late capitalism. Your view is positively restricted by your frame, which led you to the read the crisis that broke out in 2007 as financial, the result of a struggle between the far sighted capitalists who were massively funding globalization and near-sighted bankers of were frantically throwing money into the mortgage market to keep asset prices high–as if the the two processes were mutually exclusive. Where is the dialectic in your marxism without history? without people? without vision or empathy? without Marx? Many marxists, including Michael Roberts, were able to predict, not just the timing of the 2007 bubble burst, but to analyze the cause of the systemic crisis that ensued and is still with us: global overproduction and a falling rate of profit, both clearly related to the super-exploitation of a catastrophically expanding global reserve army of labor representing better than half the world’s increasingly precariously employed working people, including millions of working Americans who can’t afford the “American (nightmarish) Dream” of merely owning one’s home.. The 80’s was a time when capital’s financial/military system cashed in on its expensive but successful genocidal (Korea, Vietnam, Congo, etc.) wars national liberation regimes and movements in Asia and Africa by initiating a neoliberal policy intended bring down the cost of labor globally (which still continues) by combining regime change invasions and occupations, fomented civil wars, blockades, and colorfully orchestrated “revolutions” (Middle East and Eastern Europe) at the peripheries with so-called neoliberal labor reforms at the imperial centers: increasingly precarious, poorly paid jobs and debt peonage for those employed.